CentrikBlogsLegal AdvisoryAuthentic Legal AdviceKnow, Is Secret Marriage Is Possible According To Law? Ever thought of marrying in secret and keeping it a secret as well? Is it even possible as per the Indian matrimonial laws to get married in secret while keeping the marriage a secret? What does secret marriage Mean? 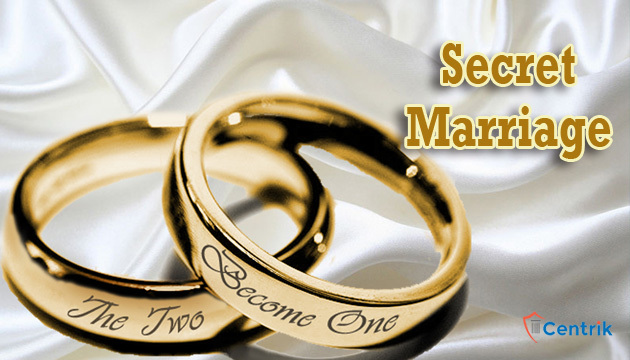 A secret marriage is kept hidden from family, friends, and society. One of the fundamental reason for celebrating the marriage, printing out invitation cards is to let the society know of the marriage. Furthermore, the reason behind printing and distribution of the invitation card is, it works as a public notice of the marriage. How to do a Secret Marriage In Court Without Letting the Parents Know About The Same? Marriages under the Special Marriage Act, 1954 is commonly known as court marriage. An Indian male and female, irrespective of their caste, religion or an Indian and a foreigner can solemnize their marriage under the Special Marriage Act, 1954. Also, in court marriage, there is no need of customary rituals as it is required under customary marriages. The parties have to directly apply to the Marriage Registrar for performance and registration of marriage and grant of the marriage certificate. The bridegroom should be of twenty-one years, and the bride should be of eighteen years of age. The parties should not be of unsound mind of such a nature as to be unable to give valid consent for the marriage. Also, the parties to the marriage should not be suffering from mental disorder of such a kind or to such an extent as to be unfit for marriage and procreation of children. A notice of the intended marriage needs to be filed by the parties to the marriage with the Registrar of the district in which at least one of the parties to the marriage has resided for a period of not less than thirty days immediately preceding the date on which such notice is given. A notice inviting objections to the marriage is published/put up by the Registrar of the court where marriage is to be registered. Objections can be raised for a period of thirty days from the date of which notice has been published. Parties to the marriage along with three witnesses must be present on the date of registration or solemnization of the marriage. THESE ARE THE CHECKPOINTS AT WHICH A PROBLEM MIGHT ARISE WHEN ANY COUPLE IS INTENDING TO KEEP THEIR MARRIAGE A SECRET. How to Do a Marriage Under The Hindu Customary Law While Maintaining the Marriage a Secret? To explain as well as to understand the above proposition, it is pertinent to take a note at this juncture the ceremonial intricacies of marriage under the Hindu rituals. Any Hindu Marriage must either be performed with the shastric ceremonies and rites or in accordance with the customary rites and ceremonies. Can Hindu’s get married in a temple or any other place without any witnesses? This is not a settled proposition and various judicial pronouncement, as well as jurist opinion, differs on this proposition. The sole conclusion which can be drawn from the available opinion is, the validity of the marriage is entirely dependent on the customary rituals undergone through. An essential custom in a Hindu marriage is the saptpadi. The validity of a marriage depends on whether saptpadi took place between the bride and the groom or not. Saptpadi is sufficient proof to call it a marriage. What is required is photographs of the ceremony. All the rituals especially the saptpadi must be undergone through for the marriage to be called a valid marriage under the Hindu Marriage Act. This was all about secret marriage. What are your thoughts on secret marriage? Do you think it is right to undergo a secret marriage? Please comment below and let us know.